Securely enable personal devices for work. Ensure personal apps can’t access enterprise data and cloud services. Protect data at rest on the device and in transit to the cloud or enterprise backend. Prevent data from being shared or accessed through unauthorized apps, such as a personal version of Office 365. 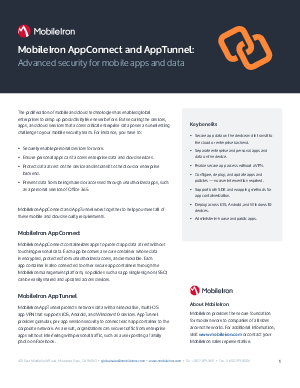 MobileIron AppConnect and AppTunnel work together to help you meet all of these mobile and cloud security requirements.